Jason K. Morrell/Twitter; Anthony Boadle/TwitterBoth Donald Trump, left, and Jair Bolsonaro, far right, have offered salutes when they didn’t have to. President Donald Trump and Brazilian President-elect have both offered seemingly unnecessary salutes to foreign officials. Trump and Bolsonaro have drawn comparisons for their incendiary rhetoric and political style. Bolsonaro, a former army officer, has expressed affinity for Trump and support for more hardline security policies. On Thursday, Bolsonaro added another point of comparison with his US counterpart. 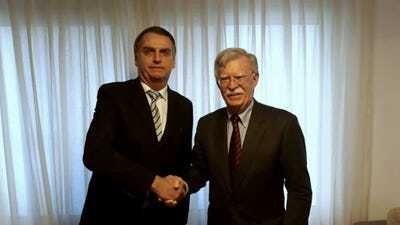 At his home in Rio de Janeiro, Bolsonaro offered visiting US National Security Advisor John Bolton a crisp salute before leading him to an open-air meeting room and offering Bolton coffee and refreshments, as Bolton exchanged greetings with Bolsonaro’s advisers. Bolsonaro, who takes office on January 1 and has said he wants to align his policies with those of the Trump administration, said afterward that he accepted an offer to visit the US made by Bolton on Trump’s behalf. Bolsonaro was also mocked for his somewhat awkward greeting, which was reminiscent of an interaction between Trump and a North Korean general at a summit in Singapore in June. In that encounter, featured in a documentary produced by North Korean state media, Trump makes his way down a row of North Korean officials shaking hands before reaching the country’s defence chief, Gen. No Kwang Chol, who offered Trump a salute as the US president stuck out his hand. The two then reversed their gestures, with Trump returning a salute, as North Korean leader Kim Jong Un looked on. 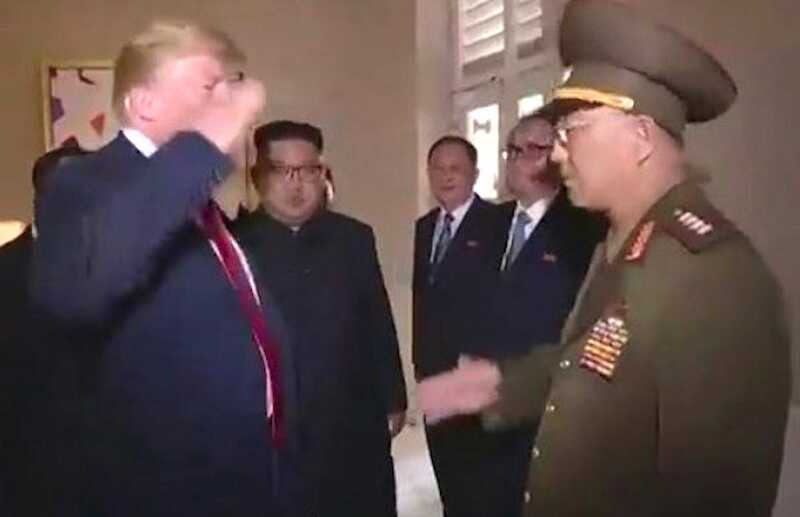 Jason K. Morrell/TwitterA still from a video released by North Korea showing President Donald Trump returning a salute from a North Korean general. Military members are required to salute the US president in recognition of his status at the top of their chain of command, but there is no regulation that requires the president to return the salute. This tradition dates to President Ronald Reagan, and which President Trump has since expanded to include members of foreign militaries – even US adversaries. Bolsonaro, who retired as an officer after 17 years in Brazilian army, has expressed support for giving the military a broader role in civil society – a stance that has raised concern about rights abuses and the erosion of the rule of law. 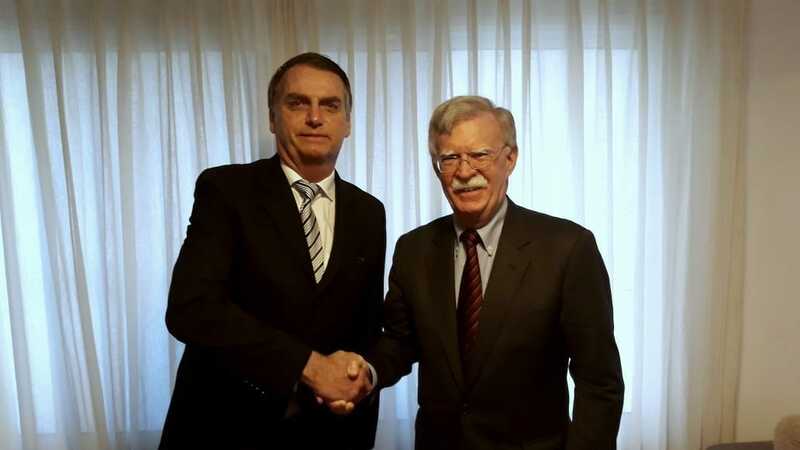 John Bolton/TwitterBrazilian President-elect Jair Bolsonaro, left, with US national-security adviser John Bolton, in Rio de Janeiro, November 28, 2018. After a successful presidential campaign in which former military leaders had an active role – including a running mate who retired as a four-star general in February – Bolsonaro appears to be stocking his Cabinet with former military leaders. On Tuesday, he said he would appoint Tarcisio Freitas, a longtime military engineer, as head of the infrastructure ministry. Freitas was the sixth minister selected who has a military background. Bolsonaro has said he wants former Brazilian Gen. Augusto Heleno to be his top national security adviser. Heleno commanded UN peacekeepers in Haiti, where in 2005 he led raid that ended in a deadly seven-hour gun battle. Other military officials tapped for the Cabinet have connections to Haiti. Former Gen. Fernando Azevado e Silva, picked to be defence minister, served there as Heleno’s operations chief. Freitas was the senior UN military engineer there, arriving after Heleno left in 2005. Retired Gen. Carlos Alberto Dos Santos Cruz, named as the next government minister, also led UN peacekeepers in Haiti in 2007. Troops have already been deployed in Brazil to address rampant crime and insecurity. Connections to Haiti among Bolsonaro’s advisers add to concerns about his expressed support for militarised law enforcement.